HA NOI (VNS)— Hosts Quang Ninh Coal received their second loss on home turf as they went down 1-2 to Ha Noi T&T yesterday. Quang Ninh Coal went ahead early at the third minute when Le Bat Hieu's straight header knocked out goalkeeper Nguyen Van Cong of the defending champion. The goal caused the stadium to explode with thousands of fans jumping to their feet and cheering. However, T&T immediately regrouped and launched continuous attacks that led Nguyen Van Quyet finding the net in the 20th minute, but it was ruled off-side. The second half saw Quang Ninh exert their strength again,nearly doubling their score as the result of a chaotic situation in T&T's box. However several close-range kicks were saved, by goalie Cong and his defenders on the line. As the minutes ticked by, many thought that Quang Ninh would finish the match with a win. However, they paid a heavy price for the loss of focus in the final minutes of the game. Gonzalo Marronkle levelled the score with a header in the 82nd minute from a corner-kick. Just a minute before the end, Hoang Vu Samson made it 2-1 for the visitors, pushing them to the third position with 12 points after six matches. Quang Ninhremained in second place with 14. This was their second loss in a row, the first being a 0-3 defeat to Hai Phong in round eight on March 15. In another match yesterday, Dong Nai came from behind to beat former champions Hoang Anh Gia Lai 3-2. The important victory helped the hosts escape from the top bottom team. 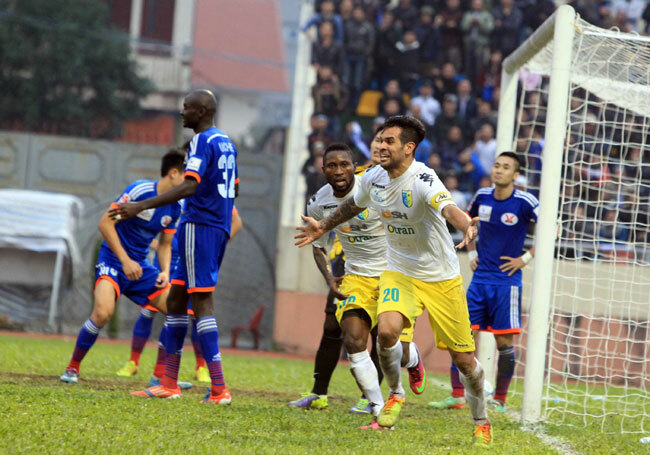 Hoang Anh Gia Lai played in counter-attack and found their first goal at the seventh minute. Meanwhile, Le Hoang Thien's long-range shot defeated keeper Danh Hoang Tuan, who suffered the second goal at the 38th after a penalty by Anjembe Timothy. Dong Nai earlier was given a penalty kick after the visiting side's Ho Ngoc Luan, in an attempt to save his net, touched his hand to the ball. Dong Nai's Nguyen Hai Anh netted exactly. He then had a second goal at the 61st. Melquiades Gomez levelled for the hosts with a close kick just seconds before the break time. With their second victory this season, Dong Nai, with 10 points, ranks ninth among 13 teams and closer to Hoang Anh Gia Lai's eighth position, with the latter team having only one more point. On Saturday, three matches were organised with Thanh Hoa staying strongly on top after beating Quang Nam 2-0. Former winner SHB Da Nang defeated Hung Vuong An Giang 2-1 and Song Lam Nghe An won 3-1 over Hai Phong. The last match saw a record in the career of national best striker Le Cong Vinh, as he scored his V-League's 100th goal. Coming onto the field in the second half, Vinh scored the second goal for the team from a penalty. "I am happy with the 100th. It is also a special one because my first goal was also when I played for my home town team, Song Lam Nghe An," said Vinh, who played with an injured foot. It was Vinh's first goal after six matches without scoring. "The goal will help him find his scoring ability. It is really important for the team, as he is the key member, after several departures of qualified players prior to the season," said coach Nguyen Huu Thang.